The latest Hulas (training and formation program) activity undertaken in ESSC’s Bridging Leadership in Mindanao project provided opportunities for Pulangiyen youth to learn technical skills on sewing, masonry, carpentry, and welding. It also provided their parents an occasion to understand their children better and learn about their activities in Hulas. 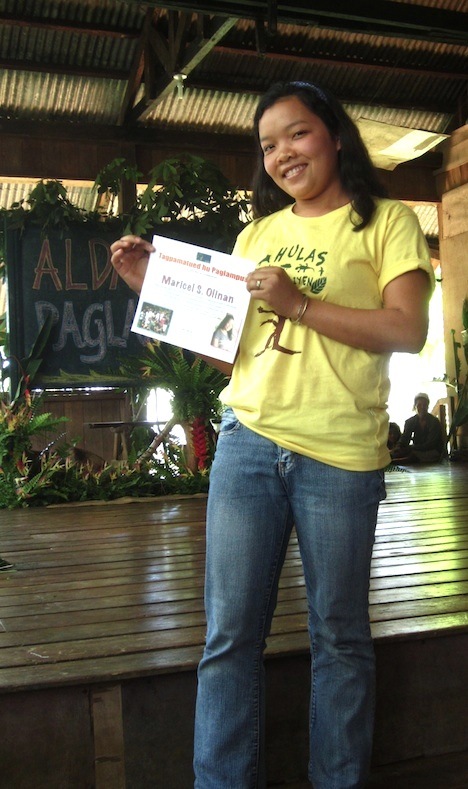 This is the fourth Hulas training batch held from 12 September to 10 November 2011 – 17 participants from the communities of Barangay Mapulo, Barangay Busdi, Sitio Nabawang and Sitio Bendum joined this Hulas batch. 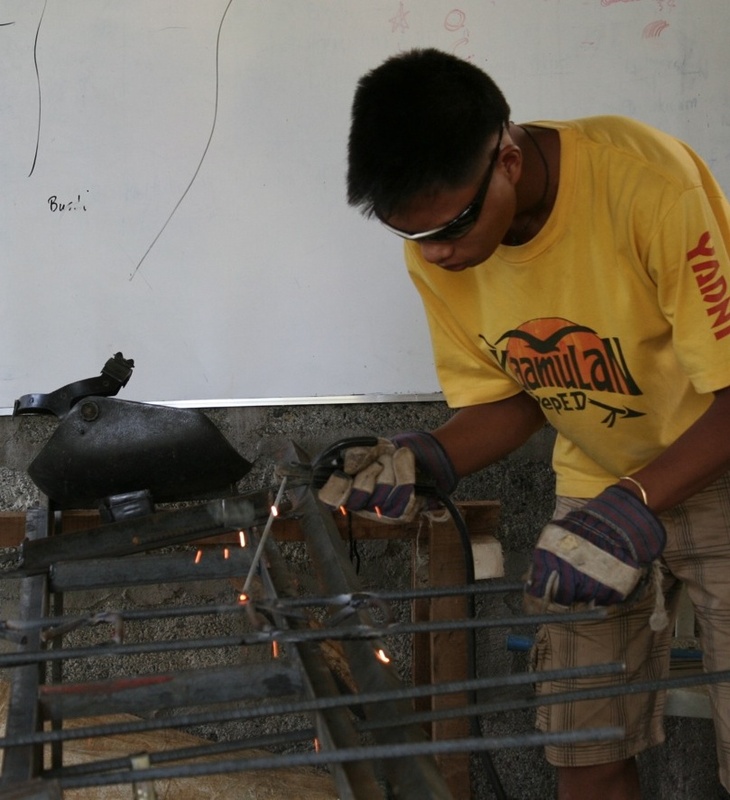 Surprisingly, welding emerged as a popular skill favored by most of this batch of Hulas trainees, even when this was the toughest skill to learn. Welding is the process of joining metals, applying heat and pressure to achieve a melting point. As a labor skill in the Philippines, welding is not as common as carpentry or masonry because welding involves knowledge in electricity, the science of fusing, and proper use of its machine and other tools. 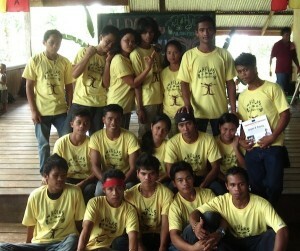 Pulangiyen young adult graduates of the Hulas 4th batch. During the family night, two parents compared the experience of their children in Hulas to that of “welding.” They pointed out two things they observed and realized. One is that like the steel that was formed into a gate or sug-angan (a cooking grill used in the traditional way of cooking with firewood), their children in the last two months were also carefully re-formed into individuals with a deeper respect for themselves. The Hulas batch of young adults is now expressing their dreams and hopes for their personal brighter future and growing in gratitude for their life and loved ones and are learning to appreciate the gifts of the environment. During one of their vacation breaks from the training, some participants expressed this appreciation by planting trees and talking about the environment’s importance to other young people in their village. They are learning to dream beyond themselves to encompass their communities. One of the graduates of Hulas 4th batch. Secondly, parents of Hulas participants are challenged to bond more closely with their children to strengthen their learning. Like the fusing of two metal rods in their children’s welding projects, these parents need to be “welded” with their children and take greater responsibility in encouraging and supporting their children as they return to their homes. One parent noted that their children’s learning can only be sustained if they provide them with the needed guidance and support. If the Hulas participants are like their “welding projects,” they are still a work in progress as two months of modular training and leadership formation, though a good beginning, is also only a short time. The intention is to build capacity and create opportunities for these young adults who are not in school to become better informed and more capable to take part in the affairs of their communities.